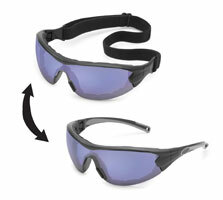 Swap safety glasses come with two temples and a head strap for dual use. Employees can wear it as a goggle while on the job, then switch to safety glasses by exchanging the temples and head strap with a simple snap. The two-color temples are rubberized for comfort, and the lens meets ANSI Z87.1+ and CSA Z94.3 standards.